WARNING: Don't try to steal a book from our library! LOL! 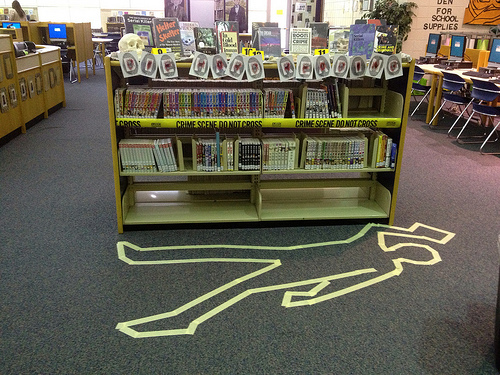 I am so proud of this collaborative library display put together by our substitute librarian, Molly Allen, our student library aides, and our Forensics Science Teacher, Ms. Cindy Alexander. We even got our School Resource Officer involved in the fun! What other collaborative non fiction displays can you think of for your library? I agree! This is awesome! Ha! Ha! Our kids fought over the same thing and now as kids enter the library some like to lay down in the outline! High school kids can be so crazy! One kid pointed ou that the deceased had four femurs! LOL! No wonder I love my job so much!